A healthy diet will help to boost your athletic achievement, notes the U.S. National Library of Medicine. Athletes such as football players need a wide range of foods to get the protein, vitamins and minerals their bodies need when participating in sports. Talk to your doctor about the athletic activities you participate in and get information about how to eat a healthy diet to provide energy for sports. Orange halves are a healthy and easy-to-eat snack for you during half time. Oranges are loaded with vitamin C, which helps to boost energy. This fruit is also a carbohydrate and provides athletes with fuel and stamina, notes Kids Health. 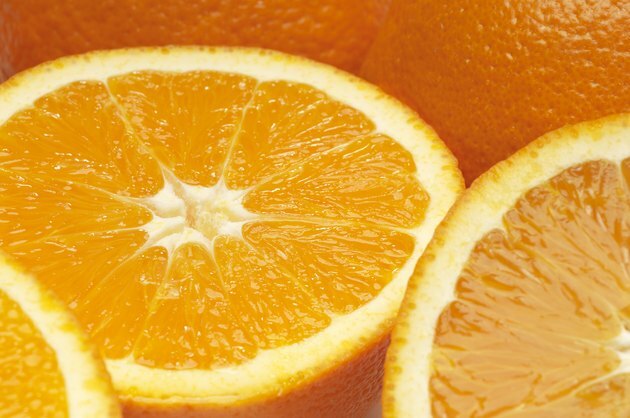 Eating orange halves at half time will also help keep you hydrated, as oranges have high water content. Hard boiled eggs are a healthy snack that is easy to transport. Athletes often require more protein than other teens, notes Kids Health. Thus, hard boiled eggs, which have a high level of protein, are a great snack at half time during a sporting event. Protein intake helps your body build muscle and repair damaged tissues, notes the U.S. National Library of Medicine. Half a bagel and peanut butter is snack that will help you fuel the body, notes the Center for Young Women’s Health of the Children’s Hospital in Boston. The bagel provides carbohydrates for quick energy. The peanut butter has protein to help muscles function optimally. Apple slices, carrots and fig bars also are high-carbohydrate foods for athletes, notes MayoClinic.com. These snacks are healthy. They are also easy for you to quickly eat at half time. Oatmeal cookies are another high carbohydrate snack that will help you regain energy during half time. Oatmeal is a healthy whole grain, notes Kids Health. Adding raisins or dried apricots to the oatmeal cookies will add nutrients to the snack. Snacks with calcium are important for athletes to help keep bones strong, notes Kids Health. A milkshake made with low-fat milk is a half-time snack that will help you maintain needed levels of calcium. A low-fat yogurt is another healthy snack with calcium for you during a half time of an athletic event. Walnuts and bananas are also healthy for athletes, notes MayoClinic.com. Walnuts have healthy omega3 fatty acids that help your heart health. They are also filling, to prevent hunger as the athletic event continues. Bananas are a high carbohydrate snack that gives you energy.